The Best Upcycling blogs from thousands of top Upcycling blogs in our index using search and social metrics. Data will be refreshed once a week.Also check out Top Upcycling Youtube Channels list for Top videos on Upcycling. 2.48 Upcycling | Who'd Have Thought? 2.52 Mich L. in L.A.
2.74 The Upcycled Timber Co.
2.84 Re-Sourcey | The magic of resourcing materials. Upcycling newsletter is a comprehensive summary of the day's most important blog posts and news articles from the best Upcycling websites on the web, and delivered to your email inbox each morning. To subscribe, simply provide us with your email address. About Blog Hi, there! I’m Gail Wilson, the author and mastermind behind My Repurposed Life. I’m obsessed with finding potential in unexpected places and believe that with a little hard work and imagination, any old thing can be made useful again—myself included! I hope you’ll enjoy the journey and pick up a few tools along the way… literally! Facebook fans 489,256. Twitter followers 7,084. About Blog The goal of Recyclart.org is to bring you good products that are made from recycling, reusing, upcycling, etc. We will not bother you with a lot of text or details, we prefer to give you inspiration through pictures and the links where you can find more information. The goal is to be a kind of portfolio based on ideas in which you can brainstorm your sustainability creativity. Facebook fans 195,756. Twitter followers n/a. About Blog Hello! We are Upcycle That and we love Upcycling! We curate and create the best upcycling ideas. Why? Because Upcycling is a great way to reuse materials and reduce our footprint. Look through our menus and browse by materials or end uses. Facebook fans 55,805. Twitter followers 8,504. About Blog Hi! My names April and my channel is all about DIY Fashion, Thrifting Transformations and upcycling old clothes into something new! Facebook fans 53,228. Twitter followers 3,065. About Blog Welcome to Sadie Seasongoods- my blog dedicated to approachable repurposing and upcycling projects using vintage treasures and thrifted finds! Facebook fans 25,875. Twitter followers 724. OK About Blog My name is Allison, If you're looking for awesome crafts, doable DIYs and amazing recipes, Dream a Little Bigger is just the place for you! With fresh content daily by our seven fab staff writers our projects have been featured all over the internet and in print in All You Magazine! Facebook fans 13,880. Twitter followers 4,125. About Blog CraftGossip Recycling is all about the variety of projects people come up with to live an eco-friendly yet pretty and festive lifestyle. Come and find great craft and DIY ideas all year round. Facebook fans 373,110. Twitter followers 46,285. Facebook fans 1,125,759. Twitter followers 27,859. About Blog Reloved is the exciting new magazine at the heart of thrifting, shabby chic and upcycling. With an emphasis on breathing new life into old, forgotten objects, it brings a hands-on approach to this thriving pastime. Facebook fans 13,519. Twitter followers 4,686. Mountain View, CA About Blog Comprehensive up-to-date coverage for upcycling, aggregated from news sources all over the world by Google News. Facebook fans n/a. Twitter followers 213,512. India About Blog Welcome to Upcycle Mania !! This is your upcycle maniac and I created this channel to share my upcycling ideas with the world. In here, I will share videos to upcycle every piece of scrap , from used plastic water bottles to kitchen waste to packaging materials used by ecommerce sites . Facebook fans 217. Twitter followers 9. London, England About Blog I am Maggy and I love all things crafty and sharing my craft ideas and how tos.The aim of this site is to provide easy, do-able and fun crafts for all ages. Facebook fans 2,018,687. Twitter followers 16,186. Birmingham About Blog My name is Medina and I am an IKEA loving , Upcycling junkie, DIY passionate , home decor crazy, renter, mother and wife. Here you will find Repurposing ideas, upcycling, diy and crafts ideas by Grillo Designs and our Grillo Designs Facebook group members. Your source for everything related to home décor and diy improvement. California About Blog I’m Dinah! I’m a work at home mom in Southern California that loves to craft, decorate, repurpose and create. I get my inspiration from several people from Martha, to my 6 year old and 4 month old daughters, and my extremely talented older brother. I spend hours getting inspiration from swap meets and flea markets, thrift stores, garage sales, and books and magazines. Facebook fans 26,361. Twitter followers 17,229. About Blog I'm Mary and I live in beautiful Greece where I like to repurpose and upcycle anything that is old or looks like junk. We use our creativity to spark some life into old things. And do it frugally! You will also see lots of photography of my Greece. Facebook fans 2,468. Twitter followers 2,734. Facebook fans 4,708. Twitter followers 224. Dallas, Texas About Blog Dukes and Duchesses is a lifestyle blog sharing DIY decor, upcycled projects, simple crafts, and delicious recipes! Facebook fans 17,791. Twitter followers 24,599. Bedford, England About Blog Pillar Box Blue is a website full of great crafting, upcycling and DIY ideas for your home. Every week there is a new tutorial of a craft or DIY to inspire you to create something unique. My home is full of the homemade. Some of it is a bit quirky but unique as I’ve created it myself. I want to share with you my enthusiasm for all things crafty. Facebook fans 1,993. Twitter followers 594. About Blog My name is Rachel. I am a stay-at-home mama to 2 little boys and 1 little girl and wife to a wonderfully supportive husband, my better half! Facebook fans 11,915. Twitter followers n/a. Chattanooga, TN About Blog Hello! My name is Giustina & I am a 20 something who is married to my best friend & the love of my life. I think everything tastes better when made with love & a splash of lemon. Although love, life, & marriage is not always easy I believe that it is an adventure worth traveling! Facebook fans 7,296. Twitter followers 1,141. About Blog I'm Laura. I blog about creative ideas in crafts and upcycled, innovative, repurposed art and home decor. Facebook fans n/a. Twitter followers 3,857. About Blog I’m Cindy or aka RecycleCindy. Welcome to my blog site that is dedicated to recycling and crafting. I love to crochet and create crafts and other useful things from recycled materials. I share many free tutorials and patterns for creating recycled projects as well as other handmade items. About Blog I am always looking for decorating and flower gardening ideas. I will share mine! Facebook fans 23,962. Twitter followers 428. London About Blog Upcyclist is an interiors blog reporting on beautiful resourceful design that reports on considered design for homes and interiors. Products, projects and ideas featured here are about being smart with resources, reducing waste, slowing consumption and finding creative and sustainable solutions that bring beauty to our everyday lives and surroundings. Facebook fans 1,824. Twitter followers 4,829. Toronto About Blog Sheri Pavlovic is the award winning DIY diva and author behind the book series, channel & blog Confessions of a Refashionista, the fabulously crafty corner of the internet packed with step-by-step upcycling tutorials for everything from groovy clothing & accessories to funky home decor a healthy dose of thrifty style inspiration! Facebook fans 6,617. Twitter followers 7,589. About Blog Hi, My name is Joan. A scavenger is defined as a person that collects things discarded by others…that’s me! Whether it be furniture, rusty junk, household items or my current favorite, pallets. When I see a pallet resting against a dumpster I get very excited. I’m also very excited to share some of my projects with everyone. I certainly have scavenged many of my ideas off of everyone else. Facebook fans 524. Twitter followers 16,704. Portland, OR About Blog Manufacturers of eco-friendly upcycled bags, packs, accessories & apparel. We intercept and utilize industry excess materials, transforming them into new, useful products — a process known as upcycling. Our sustainable, eco-friendly products are made in limited editions, and in the process save materials from landfills or incinerators. Facebook fans 8,206. Twitter followers 2,201. Toronto, Canada About Blog Since 1996 Waste Wise Products has been supplying recycling containers, recycle bins, trash cans and ashtrays to the commercial, industrial and institutional sectors. We have one of the widest selections of recycling bins anywhere in the world. Facebook fans 1,835. Twitter followers 1,431. About Blog I am Becky, a 50 something year old mother of 3, plus 1 sweet son waiting for me in heaven, a wife, junker, decorator, retired teacher. I love hunting for junk that I can repurpose, build with, or paint on. I live in 1931 schoolhouse that we are busy trying to personalize and renovate. I also love taking advantage of the great outdoors in this beautiful place I live, Montana. About Blog Upcycle Studio started with our upcycled homewares and gifts collection and has now grown significantly. It all began with a passion for upcycling that our founders Joanne and Piers just couldn’t shake. They both have a professional background in design and found themselves immersed in the world of upcycling, constantly searching for well-designed upcycled products. Facebook fans 20,472. Twitter followers 2,259. Barcelona, Spain About Blog Sustainable glass products which tell a story. We design and produce 100% recycled, handcrafted glass products. We love ecodesign! Facebook fans 1,749. Twitter followers 441. Norwich About Blog I enjoy sewing, especially with preloved fabric. A love of recycling and caring for the environment is the perfect excuse to haunt charity shops for bargains! Facebook fans 894. Twitter followers 1,597. About Blog My name is Evija and I am a 32 year old craft enthusiast.. I live on the beautiful Isle of Man and originally come from Latvia. I Blog about DIY, upcycling, creating, crafting and my life. Facebook fans 879. Twitter followers 1,678. About Blog Upcycledzine is a blog to show what upcycle design is all about. Facebook fans 3,557. Twitter followers n/a. About Blog I’m Gabi, a DIY artist, inspired by travel and timeless beauty. Follow my history dreaming, daring and creating projects for a happier life! Facebook fans 1,318. Twitter followers 40. Logan, QLD, Australia About Blog Hi, I’m Sharon Hankins – a furniture painter & restorer who loves to up-cycle and repurpose old neglected pieces and bring them back to life again. My blog was created for thrifty DIYers and home renovators to encourage them to make transformations in their own homes, with educational tutorials, tips and inspirational makeovers. Facebook fans 10,431. Twitter followers 806. About Blog Thrifty Rebel Vintage is all about sharing budget-friendly home and garden decor projects by repurposing, reusing, and rethinking. It doesn’t have to take a lot of money to create a home that you love; that reflects your own unique sense of style. You can create a home that smiles with a budget that makes you happy. It’s totally possible! Facebook fans 2,232. Twitter followers n/a. Melbourne About Blog A fashion blog dedicated to opportunity shops, charity shops, thrift stores, vintage stores, markets, garage sales, car boot sales, online stores and auctions to find those special recycled fashion wardrobe pieces. Showcasing recycled, vintage, upcycled and DIY fashion, sewing, eco-style, ethical fashion, second hand shopping tours, fair trade and general fashion chat. Facebook fans 7,035. Twitter followers 2,429. Atlanta, GA About Blog Hi! I’m Karen. I call myself a “recovering lawyer,” because I turned in my power suits for power tools and a life of DIY. This blog is all about DIY, home decorating, repurposing and upcycling, and organization. I believe in merging old and new to make a house a home. Facebook fans 3,831. Twitter followers 2,440. Ontario About Blog Hiya!!! I'm Sue Purdy; wife, mom of 3, incurable DIYer, thrift store treasure hunter, and lover of all things that make a home beautiful and functional. I love to transform a space using as little money as possible, from full remodels to fun and unique tablescapes. I live in Ontario, Canada with my wonderful husband, and 3 amazing daughters. Facebook fans 1,862. Twitter followers 452. About Blog Welcome to our Trash 2 Treasure world! It is our hope to encourage and inspire others to reuse, rebuild, revamp and reinvent by sharing our ideas in this blog. Alabama About Blog Hi, I'm Karen: child of God, wife, mom of 8, DIY addict, thrift store and yard sale frequenter, repurpose and upcycle designer, crafter, crochet instructor, garden grower, tea drinker, and deep sleeper. Make yourself at home and let's get our hands into a project or two! Facebook fans 3,430. Twitter followers 1,946. Cromford, Matlock, Derbyshire About Blog Upcycled Creative is an award winning small business founded by Lee Richards in 2012 in response to witnessing the sheer number of items that could have been recycled being thrown away. He set out to show that reclaimed items could be given a new lease of life whilst helping the environment. Facebook fans 8,303. Twitter followers 9,667. Toronto About Blog Curated by Sheri Pavlovic, the award winning DIY diva behind Confessions of a Refashionista, Refashion Nation aims to provide an inspirational resource of links to upcycled DIY clothing & accessory tutorials thrifty outfit ideas for those wanting fabulous, affordable, unique style without supporting the growing phenomenon of cheap, unethically produced “fast fashion”. Facebook fans 6,619. Twitter followers n/a. About Blog Start creating clothes sewing a professional dress form with the standard body measurements. 48. Upcycling | Who'd Have Thought? About Blog Hi, we're Jane and Meryl and welcome to our world of design innovation and creative reinvention. Meet talented designers, artists, makers and inventors. Read their stories and find out about their amazing creations. Skegness, England About Blog My name is Lianne and I am 30 years old. I live with my husband Shaun and our son Mason. Makes, Bakes and Decor is a blog full of creative ideas! Sweet and savoury recipes, fun makes, decor ideas and diy. Facebook fans 783. Twitter followers 321. NYC About Blog Posts about upcycling written by Carl Zimring. Carl is a professor of Sustainability Studies at the Pratt Institute. Facebook fans n/a. Twitter followers 683. Alexandria, VA About Blog UpCycle CRC is a community resource. We collect reusable items that are used for arts & crafts and learning purposes. We also provide a studio space where you can come to use our tools and supplies for your projects. Facebook fans 1,707. Twitter followers 533. 52. Mich L. in L.A.
About Blog Hi! I'm Michelle L. I live in a cool old neighborhood near L.A.'s Miracle Mile. Welcome to my upcycled jewelry blog, where I love to create funny or unexpected jewelry from re-purposed materials. So nice of you to visit! I hope you enjoy the weird of it all. About Blog Hi I am Mia. You can expect to find posts on good design, obscure Art trends, all manner of projects, Sustainability and quality focussed articles and anything that is good for a mention.I make all my fashion garments, craft projects, and my husband helps out with the DIY furniture projects, home reno jobs. We endeavour to work with 100% recycled materials. Facebook fans 198. Twitter followers 104. Scotland, UK About Blog My name is Evie Milo, a designer maker based in Fife and the person behind the wonderful world of creative recycling that is Milomade. From my windswept, cliff-side studio I have created a range of original and unusual jewellery, stationery, accessories and gifts handcrafted with love and skill from salvaged antique silver, reclaimed copper, vintage buttons and secondhand paper finds. Facebook fans 2,098. Twitter followers 1,483.
barcelona About Blog Upcycling Ideas and Inspiration by demano. Facebook fans 2,607. Twitter followers 58. Tucson, AZ About Blog Inspiring quirky people to create recycled arts and crafts. A creative re-use arts center with low cost art supplies, classes, and recycled gifts. Facebook fans 691. Twitter followers 6. About Blog Hi my name is Cindy and if you are here, you probably already know that I am a little bit of a trashoholic. I started Upcycled Design Lab on January 1st 2011 with the idea of focusing solely on making projects that incorporate reusing, remaking and restyling items that have outlived their original purpose. About Blog Paganoonoo is a fashion design house founded by Michelle Paganini, dedicated to creating refashioned / upcycled fashion designs and specializing in sewing patterns. This blog shares our interests in upcycling and related arts and inspiration. Orlando, FL About Blog Capturing Life’s Gifts is a mom & DIY blog. It focuses on all things motherhood along with family adventures in the Orlando area, and some sprinklings of DIY in the mixing! This blog is a personal blog written and edited by me (Amanda Morehouse). Facebook fans 597. Twitter followers 43. Facebook fans 6,180. Twitter followers 694. About Blog Hi, my name is Adriana and I am the owner and operator of Rustic Boutique along with my ever supportive and creative husband Adrian. Borne from a passion for re-purposing and recreating, our business prides itself on its unique hand finished furniture range, unusual vintage items and where possible locally sourced products. Facebook fans 5,042. Twitter followers 16. Copenhagen, Denmark About Blog Yours Again is bringing upcycled denim back to You. Denim inspires us! At Yours Again we aim to embrace the beauty and imperfection of reclaimed denim and transform it into unique pieces just for You. We turn old jeans into functional and chic fashion pieces with new styles joining our collection seasonally. Facebook fans 911. Twitter followers 18. About Blog At Kooky Blue you'll find a truly individual range of shabby chic furniture and vintage paint, along with home accessories & gifts. We specialise in up-cycling second hand furniture and stock a unique range of both vintage and hand-painted, shabby chic furniture. Facebook fans 1,017. Twitter followers 383. England, United Kingdom About Blog Hi! I'm Andrea and my blog follows my creative life following my recent move to the coast. I'm passionate about creating unique interiors on a budget, so if you're interested in upcycling, creative crafts and large and small DIY projects, as well as how to settle into a new area, step on in and enjoy! Facebook fans 27. Twitter followers 79. About Blog We take broken, unloved and unused drum kits and transform them into furniture, clocks and lighting. Based in Mid-Wales, Rock Terrace was informally founded in 2012, in the music room of musician, fabric shop owner and keen "up-cycyler", Sam Wheeler. Facebook fans 1,803. Twitter followers n/a. Wiltshire, England About Blog I’m Kathryn, a forty-something mum and blogger aspiring to live a greener life in the country. I am a second-hand junkie who cannot pass by a charity shop without a peek inside. This blog is an attempt to spread my love of all things thrifted, repaired, recycled, borrowed and swapped. Facebook fans 32. Twitter followers 610. About Blog Hi, we are Rich and Calum and we look after Orchard. Our place to share our passions. Out of work we love to create things, whether this is a bit of woodwork, upcycling furniture, baking a cake or cooking an eight-course banquet. Facebook fans 91. Twitter followers 31. Oregon, USA About Blog I’m Patty Thurlby, whimsical and quirky making fun and practical upcycled art. I started to call myself an artist in 1990 when I was accepted into my first art gallery and my mixed media pieces started selling. I had my day job but usually spent every other weekend having an “artquake” filling up my studio with new pieces and distributing them to various galleries the next weekend. In 2005 I retired from my day job in dentistry and started paying the bills making repurposed crafts. About Blog We live in a disposable society. It's easier to throw things out than to fix them. We even give it a name - we call it recycling. The purpose where I start is the idea of use. It is not recycling, it's reuse. Zanesville Ohio About Blog Girl UPcycled Studio offers artistic services and products, furniture upcycling and DIY workshops for all ages. Learn about new projects and techniques with Girl UPcycled Studio's blog. Facebook fans 9,188. Twitter followers 789. About Blog I'm Kathryn Price. In April 2017 I launched my own brand of paint, Upcycled & Co. Furniture Paint, and with it, proven processes to create all of your favourite finishes, without the need for wax or polyurethane. ​And, even better, no sanding or priming either! Facebook fans 2,475. Twitter followers n/a. 74. The Upcycled Timber Co.
Lochgelly, Scotland About Blog Handmade furniture and accessories with a difference for your home, made from reclaimed timber and whisky barrels. Gift ideas or a treat for yourself. Facebook fans 2,013. Twitter followers 157. Ponteland, Newcastle Upon Tyne About Blog Welcome to The Upcycle Jewellery Company Turning junk into funk! Most of the Jewellery is made out of up-cycled items such as old keys, bric a brack, nuts,bolts,nails etc They've all been fashionably up-cycled to look fabulous when worn by you and a real conversation piece. Facebook fans 1,504. Twitter followers 2,811. About Blog I am Beccy Beavis, wife & mother, reinvention lover and creator of the No Brand Network. I hope that "no brand new" gives you a glimmer of inspiration, changes the way you buy, pushes your creative button and shows you that with a bit of passion the "No Brand New" movement is all you need and more in this wasteful and high consumerism world. Facebook fans 1,045. Twitter followers n/a. Facebook fans 682. Twitter followers 159. Utrecht, The Netherlands About Blog Upcycle Society is a creativity center for the hands-on creation of inspired goods made from reclaimed and repurposed materials. We are exploring a range of ways that recycling and upcycling can be used to create useful and innovative items. Upcycled products are designed to create inspired, cozy spaces. Facebook fans 580. Twitter followers 160. Winnipeg, Manitoba About Blog I blog & share easy to follow tutorials on budget-friendly crafts, DIY, home decor projects, upcyling & repurposing ideas. Here you will Learn how to upcycle and repurpose items that are no longer in use or ready to be thrown and transform them into useful, creative and beautiful items. Facebook fans 454. Twitter followers 35. About Blog Little Mill House is an inspirational interiors and lifestyle blog featuring reviews, design ideas and DIY upcycles. Whatever inspires us we like to share with you. There are often some ace discounts for readers too. Facebook fans 258. Twitter followers 2,603. UK About Blog Follow us to keep up with articles on upcyling and recycling, mixed media, Gelli plate printing, collage, and more. Halifax, NS, Canada About Blog A heart to help this world by reducing, reusing and recycling things inspires me to create lusciously textured paintings (which actually fulfill my in-born desire to make sculpture). When working this way I experience a completely different creative process than when painting realistically. Dorothea's Art Studio blog describes and illustrates my art making process. Facebook fans 212. Twitter followers 10. 84. Re-Sourcey | The magic of resourcing materials. Austin, TX About Blog Re-Sourcey is a non-profit collective dedicated to saving usable textiles from landfills and upcycling them to desirable products. Facebook fans 163. Twitter followers 695. South Africa About Blog Art.love.nature is an eco arts blog that shares projects, ideas, creative work and news from all over the world that encourages a supportive, compassionate and peaceful future for Earth and all its inhabitants. It forms part of a global movement towards living more compassionately and connected to the earth. Facebook fans 127. Twitter followers 513. About Blog Life is about constantly upcycling. You often upcycle, your clothes, food and décor. Follow me for the tricks I've learned to create a more beautiful and frugal life. Facebook fans 109. Twitter followers 167. About Blog Hi there, I'm Sharon Muravsky and I own Sharon for the Home also known as Sharon M pour la Maison in my home province of Quebec, Canada. I'm Passionate about homes and the environment, I love sharing my vast experience to inspire people by showing them ways to recycle, renew and reuse; creating unique and comfortable decors. About Blog Hello, my name is Marta Hutt. This is the place where I can channel my ideas and designs. I love being creative when it comes to exploring design topics, upcycling furniture or transforming the space around me. 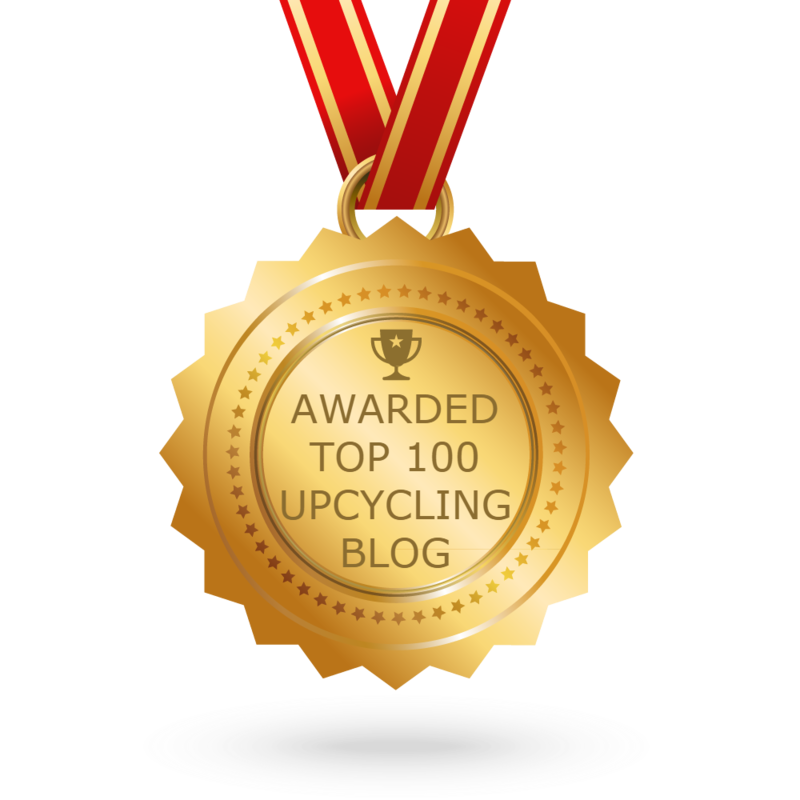 CONGRATULATIONS to every blogger that has made this Top Upcycling Blogs list! This is the most comprehensive list of best Upcycling blogs on the internet and I’m honoured to have you as part of this! I personally give you a high-five and want to thank you for your contribution to this world.